Local Authorities need to estimate well in advance to plan how to satisfy future housing needs. Outline: Government both local and national have difficulty planning for and meeting demand for accessible housing. 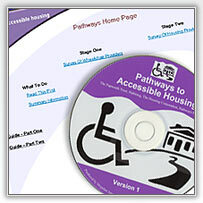 Brief: Fresh Interactive were approached by a consortium including The Housing Corporation, Papworth Trust and Habinteg Housing Association to produce a CD-ROM containing a distributable database and interface to help Local Authorities plan their accessible housing needs. Approach: We produced the CD ROM and designed and developed the content - a self-installing database package. This took the user by stages through an information gathering and collation process. The populated database could then be analysed and high-level management reports generated automatically. Result: Local authorities have a tool for planning housing needs up to five years in advance, including budgetary analysis. Accessahome is the worlds only online accessible housing register.